A bone tumor is a neoplastic growth of tissue in bone. Abnormal growths found in the bone can be either benign (noncancerous) or malignant (cancerous). 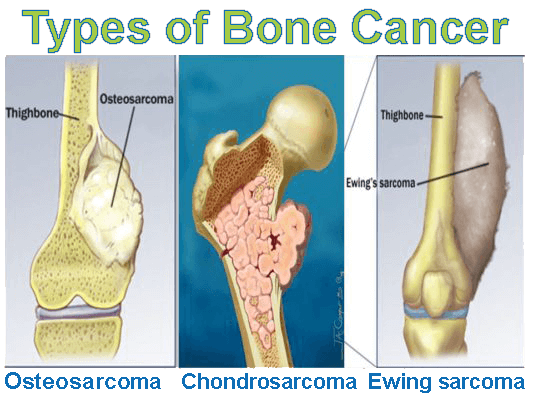 Bone tumors may be classified as "primary tumors", which originate in bone or from bone-derived cells and tissues, and "secondary tumors" which originate in other sites and spread (metastasize) to the skeleton. Carcinomas of the prostate, breasts, lungs, thyroid, and kidneys are the carcinomas that most commonly metastasize to bone. Secondary malignant bone tumors are estimated to be 50 to 100 times as common as primary bone cancers. Examples of benign bone tumors include osteoma, osteoid osteoma, osteochondroma, osteoblastoma, enchondroma, giant cell tumor of bone and aneurysmal bone cyst. Malignant primary bone tumors include osteosarcoma, chondrosarcoma, Ewing's sarcoma, fibrosarcoma, and other types. * Treatment of bone tumors is highly dependent on the type of tumor. Limb salvage surgery, also called limb-sparing surgery, to remove a tumor and avoid amputation for patients with bone cancer or with soft tissue sarcoma affecting an extremity. Our experts are often able to perform this highly specialized procedure as an alternative to amputation, which is sometimes a recommended method of treatment. To remove the tumor while still preserving the nearby tendons, nerves and blood vessels so the patient can maintain function in the affected limb. During the procedure, the surgeon removes the tumor and affected tissue, as well as about one inch of healthy surrounding tissue. If part of a bone is removed during this time, it is replaced; often using synthetic metal rods, prostheses, or pieces of bone (grafts). Soft tissue and muscle from other parts of the body are then used to close the wound. Over time, the replacement bone fuses together with the original bone, making limb movement possible. Limb salvage surgery is often used in conjunction with radiation therapy and/or chemotherapy. It is a common option for cancer that is spreading at a slow rate. At Osteocare Hospital, Our orthopedic oncologist, Dr. Jaymin Shah, who has expertise in performing limb-salvage and bone reconstruction surgeries, along with a care team which includes a rehabilitation therapist help you regain function after surgery, along with other clinicians to help reduce pain and improve your comfort. How do you decide if a patient can have limb-sparing surgery? To gather information about your patient condition and see if your patient might be able to have limb-sparing surgery, we look at many images of their bone or soft tissue that has the tumor. We ask your patient to have imaging studies before and after chemotherapy and before we take the tumor out. An MRI is very helpful in deciding how much bone and tissue we should remove along with the tumor during surgery. Imaging studies also help us assess bone healing after a bone graft and implant procedures.